Such a fun card, LeAnne! Love that you used the colors to make a Halloween card - it is so fresh! Love your very fun take on the sketch LeAnne, love your colour choices too! Thanks for joining us at Just Add Ink. Cute card. Love your use of the colors. Cassidy looks like she is having fun. We had a rain day here and more rain today too. Didn't get to see Amy, Jody, or Lisa's cards. It went directly to email format. All the other cards were fabulous! Thanks, Dona! I keep fixing them and they keep breaking! I'll try again, thanks for letting me know! What a great use of this week's colours for your fun Halloween card LeAnne! I love the mix of patterned papers and layout - I can totally see me using this! Great Halloween card LeAnne, I love those LF candy corn. 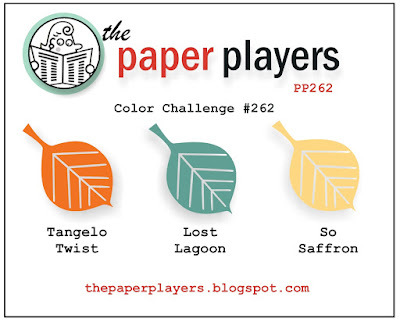 such a creative use of the color challenge LeAnne! LOVE it! Those sweet little candy corn make me SMILE! This is so cute!! The colors worked perfectly on this sweet Halloween card! Just the sweetest little Halloween card, LeAnne. Love those little candy corns and the polka dot paper is just perfect! CUTE! You made the colors work perfectly for Halloween. I love the patterned paper you used,too. This card is making me hungry for a bag of candy corn! I just love it with peanuts..yum! This is so cute and love those little Candy Corn. We don't have Candy Corn in New Zealand but a friend sent me some last year, it was delicious! Fabulous use of the sketch too! So very glad you joined us at Just Add Ink this week! I love this! The colors are just perfect for your candy corn images. Love the layout too. Fantastic card! !